The way in which people receive news has changed dramatically due to the Internet. Newspapers now post stories, pictures, videos, and audio online, causing the role of the reporter to develop and shift. Despite these changes, there are two things that remain unchanged. A reporter’s view of deadlines can change, oftentimes dependent on where they are in the writing process. Deadlines can provide the motivation needed to complete reporting in a timely, efficient way. But they can bring about stress as well, at times leaving reporters feeling as though the story being published is incomplete. 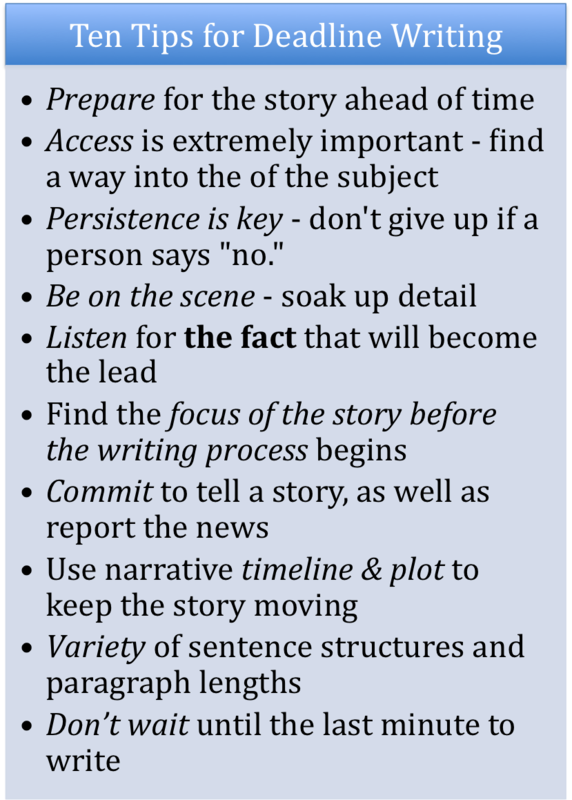 Regardless of a reporter’s beat – features, news, sports, opinion – learning to write quickly is extremely important, a skill that is often the result of continued practice. The more one writes under tight deadlines, the more they acquire an ability to write through an efficient process. “America’s Best Newspaper Writing” highlights four journalists who produced amazing stories while writing under deadline and the practices they used in order to write true, riveting news stories. Richard Ben Cramer’s Shiva for a Child Slain in a Palestinian Raid was published in “The Philadelphia Inquirer” in March of 1978. It provides, not only a picture into the life of a family impacted by the death of their daughter, but a view of the way in which human beings, families, and hearts as a whole are impacted by conflict. In order to write this story, Cramer had to gain access to this family, crossing lines of tension and violence. 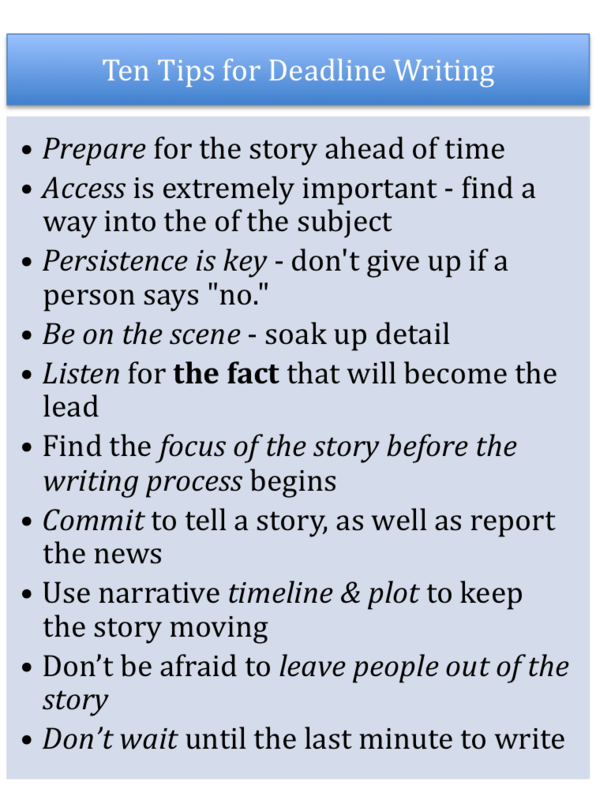 Seeking access into people’s lives and experiences, despite the obstacles in the way, is an important part of a reporter’s ability to write a story, particularly under a tight deadline. Cramer also illustrates the power that can come from allowing others to tell the story. His work is filled with quotations from members of the young child’s family, the one’s close to her breathing life into the story. Oftentimes, this is an extremely effective way to give the readers the facts from someone who is closely connected to the story. An ability to write during the reporting process has proved to serve jouranlist Leanora LaPeter well. She has learned that it’s important not to wait until the last minute when writing under deadline. As events unfold, begin to think about what fact will become the lead and which quotations will help tell the story. In September of 1999 the “Savannah Morning News” ran LaPeter’s story titled Jury Sends Santa Claus Killer to Electric Chair. The story focused on a young man found guilty of a number of charges, from murder to kidnapping. LaPeter’s story has impact because of her writing process. She was sure to prepare for the story in advance, a tip that proves to be extremely helpful when writing under deadline. David von Drehle’s Men of Steel are Melting with Age, published in the “Washington Post” in 1994, is an example of the power that comes from providing a clear setting for readers. The use of a narrative timeline and plot allow him to simultaneously tell the story and report the news. In March of 1988, “The New York Times” published a story titled In Belfast, Death, Too, Is Diminished by Death by Francis C. Clines. Clines’s work clearly displays the importance of being on the scene when something is taking place. Being present allows for the inclusion of sensory details. A Pulitzer Prize winning piece, this story about the massacre that took place at Columbine High School is an example of how important it can be to gain access to individuals impacted by things taking place around them. The day after the tragic event, staff members at the “Denver Post” interviewed several students who survived. “Stanley “Tookie” Williams walked in chains and cuffs through the oval door of the execution chamber. Four uniformed men entered with him. Midnight remained a minute away. In a semi-circle around the mint-green octagon, 50 people sat in chairs and stood on risers, peering through thick glass as the guards laid the Crips gang co-founder on the table. Not only does Frankel report the news, but he also tells a story. There is a variety in the structure of his sentences, as well as the length of the story’s paragraphs, that provides impact. Also, the language used is extremely descriptive and his word choice extremely effective. 9/11 is a day that impacted individuals across the nation, and when a commemorative ceremony was held a year after the event, journalist Dan Barry was there to make observations and write a compelling story. The use of specific time and narrative details gives the story a flow and a life. Barry captures the solemnity of the event, the words themselves seeming to contain a comber quality. Not only does this story use narrative techniques, it also contains a lead that is extremely effective. Each sentence ends in a way that causes the reader to want to continue. It is also a exemplary example of the way in which news stories focused on around a controversial topic can be approached and reported.